LEICESTER, England, Aug. 28, 2012 — A technology used in projectors can create a high-resolution image 100 times faster than conventional microscopy equipment, which can be too slow to clearly document speedy biological processes. The confocal microscope, developed at the University of Leicester, addresses the need for rapid-scanning microscopes with no loss in image quality. It bolts onto a regular microscope and projects patterns of light through a system of mirrors onto the microscopic sample. Only light that is precisely in the plane of focus returns along the same path and is reflected by the mirror onto a camera to form an image. By programming the mirror device, the researchers can easily adjust the illumination pattern for different types of specimens and conditions. The microscope also takes out unwanted light that comes from regions of the specimen that are out of focus, helping to improve image quality. The images produced can be scanned onto a computer at about 100 frames per second, showing biological processes such as cell activity at higher speeds than conventional devices, which typically scan around 1 frame per second. 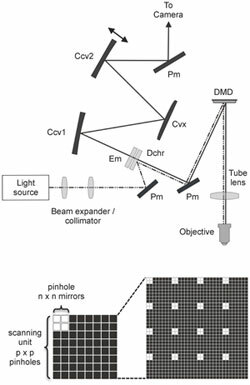 The microscope has no moving parts, and its digital micromirror allows the size and spacing of mirrors to be altered to select the image quality and to adapt to various imaging conditions. This technology will be helpful in various scientific fields, including biomedical research and neuroscience, the researchers said. 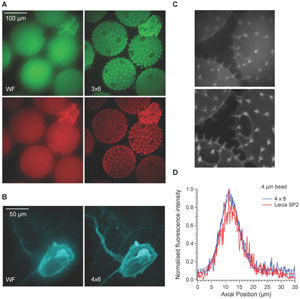 Examples of wide-field and confocal images of biological specimens. The device, funded by the Biotechnology and Biological Sciences Research Council, took three years to develop. Hartell is working with the university’s Enterprise and Business Development Office to commercialize the technology. He plans to use the device for his own work studying the cell mechanisms involved in memory storage in the brain. The results were published online Aug. 24 in PLOS ONE.